Pre-theatre times Available 4.30–5.30pm, 10.30–11.30pm. Tucked along the castle ridge, the Witchery is one of the most spectacular dining rooms in Edinburgh, hosting a kitchen devoted to Scotland’s larder. The 2019 edition of The List's Eating & Drinking Guide is out now – only £5.95 (+p&p). Hunkering near the castle at the top of the Royal Mile, the Witchery must have the most beautiful dining rooms in Edinburgh. The oak-panelled, tapestry-hung Witchery and the sweeping staircased, double-height Secret Garden are beautifully maintained – this 16th-century Scottish merchant’s house certainly has tremendous wow factor. Though patronised by well-heeled tourists, it remains popular with locals, devotees and business people who have been coming for years. An impressive wine list might be one reason for return visits, or the devotion to Scotland’s larder. Serving from lunchtime through to post-theatre, diners select from a choice of set or à la carte menus. Scottish seafood shines – Oban oysters, Buckie crab, Mull scallops and Loch Etive eel gleefully compete for attention. Mains are equally divided between vegetarian, fish and meat offerings, all tempting and considered, be it a parmesan and roasted vegetable tart, wild sea trout or Cairngorm venison. If you’ve still room, passion fruit and mascarpone trifle is a tangy delight or kir royale sorbet offers a fresh finish. Located in a historic 16th century building at the gates of Edinburgh Castle, James Thomson's Witchery is the most atmospheric and spectacular dining destination in the city. A unique setting, stunning interiors and superlative food, wine and service combine to create memorable dining experiences for locals, visitors and celebrities alike. The staff use the best of Scotland's produce including Angus beef, lamb, game and seafood. 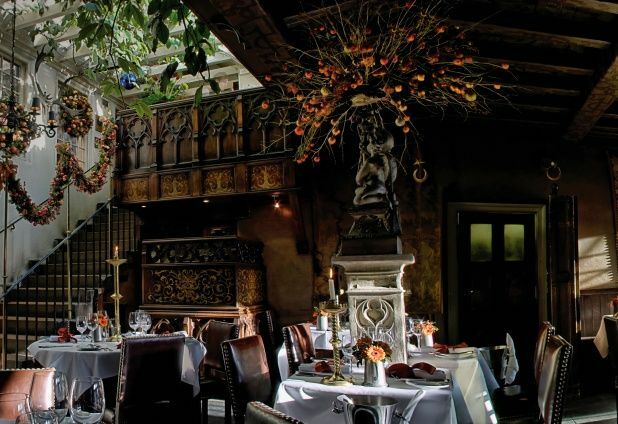 Nestled in the most historic part of the building, The Witchery dining room is rich, warm and atmospheric, with tapestries, mirrors and carvings hanging on oak-panelled walls. Spectacularly painted and gilded ceilings, similar to those at the Palace of Holyrood House, celebrate the links with France in the Auld Alliance, whilst much of the panelling was rescued from St Giles Cathedral and a Burgundian Chateau. Gilded antique leather screens, polished church candlesticks and opulent red leather seating complete the surroundings of this splendid dining location. Looking for events in Edinburgh?